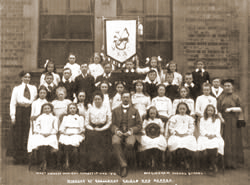 Prior to Beckingham School being built in 1901 children were taught at the Old School on High Street. The Old School (known as the National School) was built in 1854 on a piece of land belonging to the Church of England. Records of schooling in Beckingham date back at least as far as 1731 but it is not known which buildings were used as schools. It is clear, however, that schooling was much under control of the C of E. The Vestry meeting of 1811 agreed to fund the education of 10 poor children at the school. Pesumably the other 80 pupils had to pay for the privilege of being taught by one master and one pupil teacher in one large room. The school closed after the Boards School (now Beckingham Primary School) opened and the building became the Church Hall and Sunday School until it was sold to its resident caretaker in 1975. The school room was also used, during the 1980s, for a Mums and Toddlers group and today is owned privately as a residential dwelling. 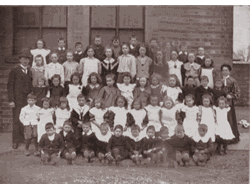 In the early 1900s it was clear that the National School was too small and needed enlargement. There was some hostility to the idea that the enlargement be funded out of public rates because the school was the property of the Church of England and this created a division between the Methodists and Anglicans. Eventually a poll was taken to decide whether the old school should be enlarged or a new school built which resulted in the School Board being formed and consequently the new ‘Board School’ being built. 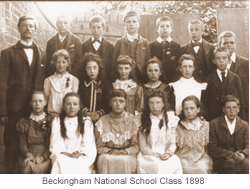 Beckingham Board School was built in 1901 on a piece of land donated by the Watson family. The land was in Clappin Close which was an area between The Green and Institute corner. The school was designed in Gothic style using red pressed bricks and Ancaster stone dressings to the windows, entrances, quoins and gables. Within the spandrel panel of the main arches was carved in high relief "Beckingham Board School 1900" out of red sand rubbers. The roof is of slate and in the centre of the ridge of the main roof is an ornamental bell turret at a height of 40 feet from ground to weather vane. The original building was 49.5 feet by 18 feet and included boys and girls cloakrooms, an infants' room and classroom, with a further large full width room that had a wooden partition to provide 2 further classrooms. 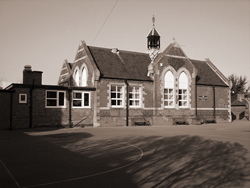 The school was built to accommodate approximately 160 children with separate stone chip playgrounds for boys and girls divided by iron railings and outside lavatories. On the east side of the school the headmaster's house was built in a similar gothic style with bay windows on the front. The accommodation originally comprised of:- Ground floor - parlour, kitchen, scullery and entrance First floor - 3 bedrooms. Toilets were outside. 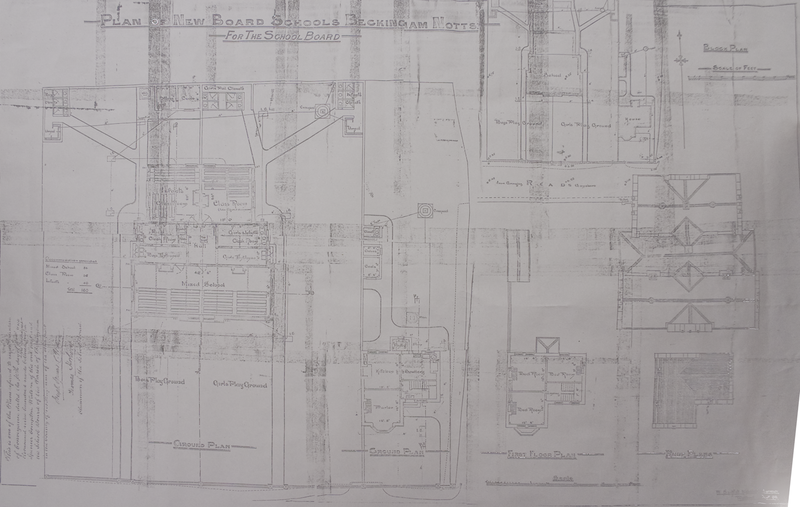 Click here to view a copy of the original plans (large file). The Greenwood’s tender was accepted but it was reduced and even so the New Board School’s members we still ‘alarmed’ at the outlay. The architect of the school was Mr William Southall of Eyre & Southall (Retford). The first spade of earth turned for the new school was in August 1900 and Mr J S C Watson attended the ceremony (in place of Sir F Milner who was otherwise engaged). Mr Watson was especially interested in education for the village (having already donated the land) and delivered a fine speech extolling the pride of having such a fine school in the neighbourhood. There followed refreshments and entertainment for everyone in the village and in the evening sports were provided for the children. At around circa 1949 the canteen was built on the west side, removing two windows and fitting these on the front of the school, giving it a much more attractive and less foreboding look. With the canteen came school dinners which were prepared on the premises, prior to that children went home for lunchtime except those who lived in Saundby and Watson’s Shipyard who brought sandwiches. In addition to the main school there was a wooden shed to the west which was used as a woodworking set. In 1954 when Misterton Secondary School opened the boys would travel to Misterton once a week for their woodworking lessons, and the girls went there for cookery. In 1972, once the estate of John Surfleet was sold, Lot 2 was purchased to provide the school with a playing field and the new school extension. This extension provided 3 new classrooms, an administration area and a wet activities area for painting and art classes and was accessed by The Limes with a direct pathway linking the 2 schools that ran alongside the Institute Allotments. The extension was started in November 1980 and completed in July 1981 and was built to blend in with the surrounding houses. The opening ceremony was formally opened by Mr Philip Stephenson, Chairman of Beckingham School Governors, and the headmaster at the time was Mr Wilson. Two pupils dressed as Victoria schoolchildren on the day. The first headmaster for Beckingham School was Mr William W Arthur who was headmaster until his retirement in February 1933. On his retirement there was a special presentation of a Westminster chiming clock which had been inscribed and presented by an old scholar, Mr J Wilkinson. A speech by Mr F Gagg (chairman of the School Managers) referred to the good work Mr Arthur had done in the village during his 34.5 years as headmaster (formerly headmaster of the Church School) and he was highly thought of by scholars, teachers and friends. Mr Arthur died in May 1936 aged 68. As well as headmaster of Beckingham School he was also churchwarden and choirmaster at Beckingham Parish Church and a member of the Parish Council and was held in high esteem by the village. His only daughter, Miss Vera A Arthur was headmistress of Walkeringham Junior School and she married Mr Richard Felton who was headmaster of Hyde Park Senior Boys’ School in Doncaster.Mr Arthur’s only son died at the age of only 36 years, he too had been a teacher. Mr Kingston 1953 to ? Mr Wilson 1970 to ? Please contact the website if you would like any details regarding any of the school photographs shown, or, if you have any photographs you think may be of interest to the History Group (all original photographs will be returned after copying), please do get in touch. Please click here to go to Beckingham School website.